Monitor your database connectivity and query results 24/7. This add-in utilizes your ODBC data sources in order to established the connection with the database or database server and then optionally issue SQL query against the database. The results of the query can be evaluated for the number of rows returned, the value of a variable assigned in the query, or can be used simply to executed a stored procedure and test the query time. Use of this add-in is generally utilized to test the following aspects of your database server. Server or Database is accepting connections. Server or Database is accepting logon credentials. The time to connect is within the specified threshold. The server is accepting queries. The returned results are within specification. The time to complete the query is within specification. 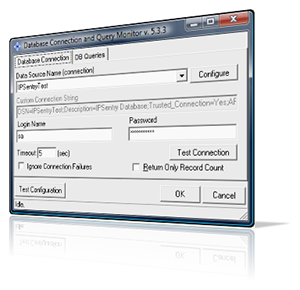 The ODBC Database and Connection Monitoring Add-in connects to a database over ODBC and optionally executes a query, and optionally evaluates the results. Notice how many times we mention 'optionally'? There is a reason for that. The add-in can be used to just test database connections on your network, it can be used to submit and EXEC query that returns no results, and/or it can be used to perform a query that will return row data which can be counted by ipSentry or you can design and SQL query to return a specified value that the add-in can evaluate. For example, let's say you know there should be 10000 records in a given database at all times, and of those we know that 2000 of them will always contain a specific value in a specific column. We could simply have the add-in perform a basic 'SELECT * from db where column=value' query against the database and evaluate the count as being required to be at least 2000. Now, that can be pretty resource intensive, so we also provide the means to utilize just a SELECT count() option and this information is available in our help documents. You can also query system table values, status values, all kinds of cool things where a numeric value can be returned and compared to denote failure or success.